This apple cookie jar sat on the top of my grandma's refrigerator for as long as I can remember. When she went to heaven and we were dividing up her kitcheney things, it was not one of the more popular or highly coveted items. I didn't have any particular connection with it (or so I thought), but when I saw it in the pile of things being donated to the Habitat thrift store, I just couldn't bear to see it go that way. So I brought it home and now it happily lives on top of my refrigerator. Even though it might not seem like my kitchen style, it fits perfectly and reminds everytime I look at it of my grandma and the love we all felt in her kitchen. 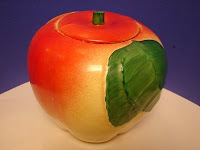 As a side note, a quick google of 'vintage apple cookie jar' helped me to learn that it is a piece of Hull pottery and an identical one is going for $100 on ebay right now. Not that I care because I'll never sell it. I don't actually use it for cookies, but it is a perfect place for matches and spare keys. For a while, I was very "lamp-poor" and only had those cheapy plastic-domed halogen lamps, but lately I've been scoring big time in the lighting department. I found a pair of painted wooden lamps at a yard sale recently for $6 and with new linen shades, they look pretty comparable to pricier ones I saw at Urban Outfitters. They are the perfect addition to my bedside tables. I added ribbon trim that can be removed if I change my mind. Then this weekend's bargain was a super cute lamp with a clear acrylic base (similar to the one on the right) for only $5! Yay! It looks pretty good in my room and I have a feeling that I'll be tweaking things so that it looks great. My decorating is a work in progress, but that is the fun of it. If everything was just how I wanted it, I would get bored so fast! This weekend turned up some real gems in the yard sale loot department. 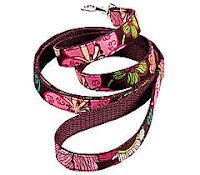 One little trinket that caught my eye immediately was a Vera Bradley dog leash. While I'm not really a fan of Vera's purses and luggage, her print looked really cute on this leash. The one I got for my big guy is not this exact fabric, but is a very adorable western-ey red paisley. The tag from the store (still attached) said $17 (gasp), but for the yard sale special price of $3, I say it was definitely worth that. I can't wait to take my pup out on the town so he can show off his stylish new digs. Southern hospitality never smelled so good! Lately, I have been discovering some really neat hidden gems in the way of thrift stores. The reason these gems are such an untapped resource? I think some people may be afraid to step foot inside, but I say never judge a book or a store by its appearance. And what does it hurt to have a look?...nothing is lost anyway. Two of the treasures I found recently were at a little shop aptly named "Thrift Store." I found these great candles (brand new) for $5! They are from the Harr y Slatkin collection for Bath & Body Works. 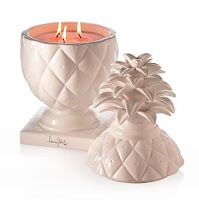 I love the pineapple shapes and they are big enough (almost a foot tall) to make an impact. They are so bright and clean and both smell really yummy. One retails for $40 and the other for $20 so needless to say, I probably would have passed them up at b&bw. but $5 is just up my alley. Yay candles and yay for being adventurous! This little plate is very near and dear to my heart. 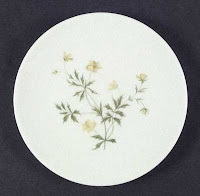 Actually there are four little plates just like this one with simple yellow flowers and brambly looking leaves. These plates belonged to my great grandmother (also near and dear) who would use them to serve me my favorite breakfast delicacy: cheesy eggs. 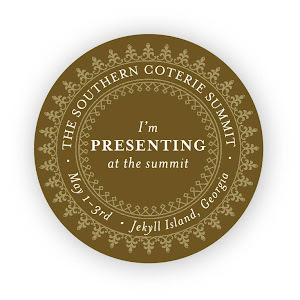 Thus coined "the cheesy egg plates," I really hoped that they would be passed on to me and yay! they were. I never knew anything about them because they held such sentimental value, I couldn't imagine t hem being anything too valuable. According to the stamp on the bottom they are Peter Terris china, but that's all I had to go on. Ah the glory of google! I was browsing replacements.com (a favorite site of mine) under Peter Terris' collection and lo and behold, the first pattern I looked at was called April. Here is the dinner plate from this pattern. Recognize those little yellow flowers on the lower right of the plate? Upon further investigation, I found that my plates are actually the salad plates from this pattern. 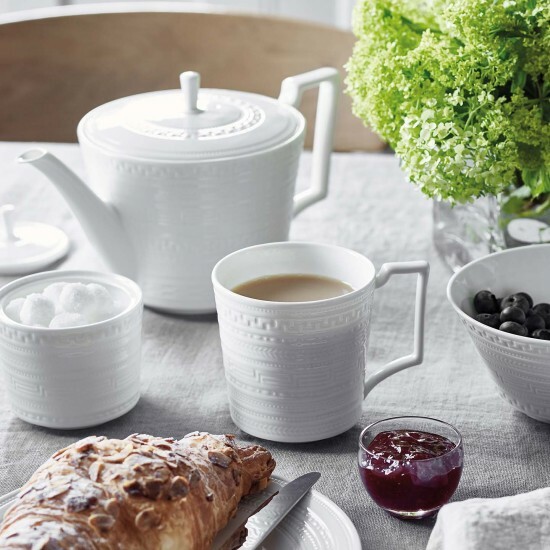 There aren't many available to buy, but there is an adorable litle gravy boat with green ivy as well a sugar bowl with a wooden lid. I just love the whimsical placement of the flowers and even though all the pieces aren't the exact same design, they go together so well. 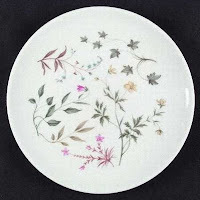 While most of the treasures I received from my grandmother cannot be seen, these plates serve as a reminder of her repeated acts of love to a little curly-haired girl sitting down to cheesy eggs, with yellow flowers underneath. isaac + liz = yay! I have always loved the liz claiborne brand (to me it embodied classic womenswear) and now that Isaac Mizrahi has taken the helm as creative dir., it seems like just the push LC has needed to make it a little more young and modern. I think the print ads are so cute and I love how IM sneaks himself into the frame, with his trademark bandana no less! You will find me scouring the sale racks at Belk for any and all of these pieces, I guarantee it. I heart cupcakes in the springtime! There is nothing in the world like a cupcake. I know they are uber-popular as of l ate and everyone has jumped on the craze, but what's not to love? Small & sweet. Cute & delicious. For a long time, my heart belonged to MagPies alone. This Knoxville bakery pretty much delivers the goods. As the humble cupcake's popularity has grown, a couple other shops have opened in town that give them a run for the money. Mind you, nobody can take their place. White cake/vanilla icing cupcakes at MagPies can't be beat. Cities Cupcakes has a great strawberry version they call "the Paris" (all the flavors are named for a different city) and the CupCakery's Tuxedo cupcake is also a big favorite within my inner circle. Even if you aren't a foodie or a sweet-lover extraordinaire, I dare you to eat a cupcake and try not to smile. They just have that effect on people. Now go get one!